Three visits this week to the Hadfield – a pub I’d never got to in my whole life until less than a fortnight ago. It was so hot on Sunday that I had to drink lager. It’s strange stuff, isn’t it? In the couple of hours it took the players of the England team to be shown up for the laughable cretins they are, I chucked four or five pints of Kronenberg down my gullet. It barely tasted of anything at all. Dangerous. Are you on the Twitter? The last time I heard so many people saying they didn’t understand something, it was indie music in the 1980s, so I figured it couldn’t be all bad. Follow me @sparklepete if you like. This week’s pubbing has taken place entirely here in Sheffield. Thanks for reading. To the Hadfield again for England v Slovenia. A reasonably diverse smattering of fans have got the afternoon off work, or are students quite rightly making the most of their temporary freedom from wage slavery. It’s a very polite little cheer that goes up when England get the goal. At the Freedom House in the evening, the lounge is closed and only the bar room opened. There’s another thing about two-room pubs: during quiet times, they give the management an easy way of cutting the overheads. Lingering too long in the lovely garden at the University Arms means we’re late for the start of the music quiz at the West End. Craig, Cara and I enjoy the best of both worlds, though, answering questions among ourselves here and there but without having the quiz dominate our conversation all night. Pleasant surprise of the night comes afterwards at the Harley – a bar-type pub where I’ve seen some fine bands in the past but never really warmed to. Maybe it’s the Chick Habit DJ night, maybe it’s the company, or maybe I’m just so damn grown-up that I am no longer psychologically intimidated by hipsters – but when midnight strikes I am tapping my toes tipsily to Petula Clark with only the dimmest awareness that in about six hours’ time I’ll have to get up to make Dairylea on toast for my one-year-old son’s breakfast. 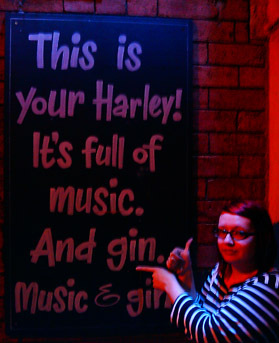 As much as I’ve enjoyed tonight at the Harley, I will continue to enjoy making fun of the Harley for the emphasis given by its hipster-centred marketing to the fact that one is able to buy and drink gin there. Gin? Really? In a pub? With ice, lemon and a dash of irony. Less of a fun time at the Hadfield today. The bar is staffed by an unsmiling man in some kind of Chelsea shirt. Rather than say hello or ask what we’d like to drink, he silently glares at us. It’d be harsh to blame the pub for Brazil v Portugal being a truly rotten game of football. But after we’ve finished our lunch, the plates still lie uncollected on the table more than an hour later when we get up for a game of pool – despite the pub being almost empty and two bar staff being on (the other fella seems quite a bit more friendly, to be fair). As we rack the balls up, an ‘oldies’ radio station called Gold starts to blare through the speakers. It eschews the many thousands of great songs recorded across the last six decades of popular music in favour of ‘Living Next Door to Alice’ by Smokie. I don’t like obsequious service. I can’t stand being called sir by awkward 18-year-old boys when I’m getting an overpriced round in during a wedding reception at a posh hotel. But, y’know, it’s not too much to ask that bar staff have some kind of basic human empathy and then sometimes remember you’re actually there. Maybe this is all very harsh, though, and someone was just having a bad day and we shouldn’t assume the worst. 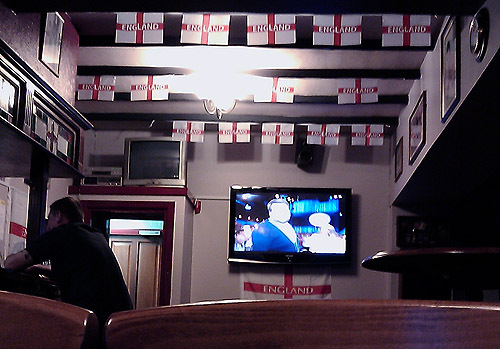 I resolve to go back for the next England game on Sunday. A quick one at the Red Deer after band practice. It’s lunchtime, but they don’t do lunch. Presumably because it’s Saturday. A shame, because they do some good stuff here. Getting a pub lunch in Sheffield can be a lottery; sometimes you can see why Wetherspoons do such good trade. The Red Deer’s beer seems to get better with every visit, mind you. Bravo. I could barely move in the Rutland Arms the other week; tonight we have the place to ourselves. Happily there are enough of us here to make Dan’s birthday a thing of festiveness. Tonight’s mystery: why we’ve never used the jukebox before. It’s ace. Over at the Washington, by contrast, it’s cheek by jowl. 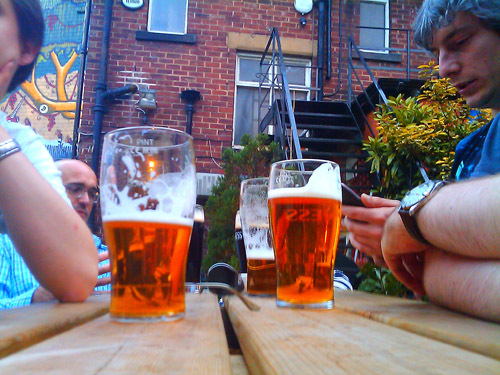 With the 2007 floods still fresh in the memory, every Saturday of beer garden drinking could be our last of the summer. The Hadfield is much better today than on Friday. The England football team, unfortunately, is much worse today than on Wednesday. I really don’t remember being in the Washington. It’s neither big nor clever is it? Kinda fun though.